Oops! Up Side Your Head – Ted Cruz And Cohort Mike Lee See Their Own Poll Numbers Plummet | Reclaim America From The Lunatic Fringe! “Two prominent advocates of the GOP’s strategy to defund Obamacare in a government funding bill, Sens. 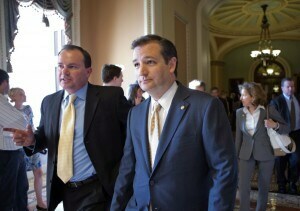 Ted Cruz and Mike Lee, have seen their favorability numbers drop in separate new polls. Are The American People TRULY Conservative?